COMMENTS: Exactly what I expected from this little soap box. Makes mailing much easier! "Excellent Packaging for an Excellent Price"
COMMENTS: My favorite thing about these boxes is that they are easy to fold. You just fold the sides in and voila done. They also hold my lotion bars and shampoo bars with out too much rattling around! Highly recommend them. COMMENTS: I wasn't sure what to expect size wise when I ordered these, yes I know it gives you the size..lol However, most of my bar soaps fit perfectly in them! I will definitely be ordering them as needed and highly recommend them. COMMENTS: These boxes are perfect for packaging my soaps! I've never been crazy about cigar bands or shrink wrap, so these provide the perfect alternative while still keeping my products looking professional. They're good quality, too, so I'm never worried about them tearing. COMMENTS: We have tried every way to package our soap. 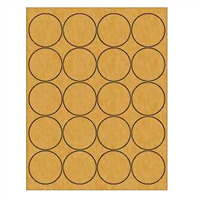 Shrink, cigar bands, wax paper sheets, etc many reasons they just didn't cut it. We both have issues wrapping etc, due to health issues. Not only could we use these much easier but we packaged (boxed & labeled) over 300 bars in one evening and they look great!! We're halfway through the first box and will be getting another box in a couple months. COMMENTS: These are my go-to boxes! They are the right price (especially when buying in bulk), they are sturdy and they just give our products an overall quality feel. These come pre-glued on the long sides, so they are super easy to assemble, pop out along folds, then close the top/bottom ends. 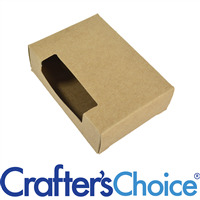 We've tried boxes from several other supply stores and these are by far the best. "Perfect to keep the soap clean"
COMMENTS: These boxes are perfect for a professional look for my soap. I then add a custom designed label and people love that they are ready to give as gifts. COMMENTS: I used these with my melt and pour soaps for craft shows and they make a nice package. COMMENTS: These are nice and give a professional touch to my cold process soaps. COMMENTS: I like this one because I am able to cut out my own window design. COMMENTS: They make my soaps look so professional with my logo. The one thing I will say is that if your soap sweats, be careful- you'll ruin the box. COMMENTS: Perfect box for soaps if you want to keep things simple which I do! I will be back for more of these boxes and the kraft color goes great with my packaging! 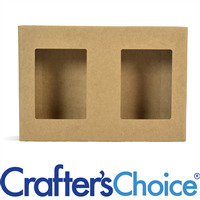 COMMENTS: These are nice, sturdy soap boxes and are the perfect size for bars made in the Regular Loaf Mold 1501 (that don't have a layer of embellishments on the top). COMMENTS: Much bigger than you'd think, I'll be ordering these again! 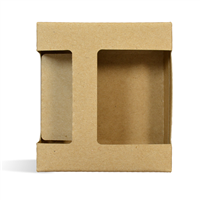 "100% Recycled Content Soap Boxes with No Windows"
COMMENTS: Thank you for selling a 100% recycled cardboard soap box with no window! 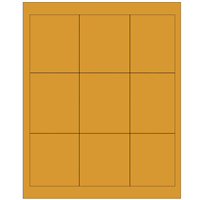 This product is extremely difficult to find for sale in reasonable quantities (less than 10,000). COMMENTS: Great for packaging soap! COMMENTS: I looked for soap boxes from several different companies & bought this box for my melt & pour soap. 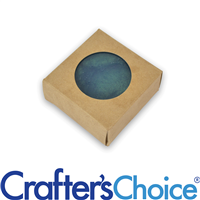 This box is a perfect fit for the crafter's choice oval silicone mold. After my decals were placed on the box, it looks GREAT! COMMENTS: This was the perfect choice for my lotion bars. Presentation is much more professional! "Great Gift Boxes for shipping!" COMMENTS: I bought these to ship Christmas presents to family last year. My daughter hand painted them and added addresses. The family loved the homey, crafty look when they received them in the mail. Perfect way to ship just a bar or two! "Great for 1 - 1.25 inch thick cut soap"
COMMENTS: I use this box for my 3 x 2 x 1 soap made in a log mold. There is still a lot of room for these soaps within the box, but to remedy that, I pop a little packing peanut in before shipping. I really like these boxes, and the price is reasonable. "Quality box for a high end look!" COMMENTS: I love these boxes. I tried shrink wrapping my soaps but ended up melting them and making a huge mess. These boxes not only solved my soap packaging issues - but far exceeded my expectations. They fit my rectangular soaps perfecting (mold 1601), take a label well and give my soaps a really high end look. Never stop carrying these!!! COMMENTS: These are much bigger than the ones I usually get and make it easier to fit larger bars instead of having to cut them down. Love these boxes. Just picked up 500. Thanks! COMMENTS: I love these boxes! They fit medium and large soap bars perfectly. I do them up like tiny presents and my costumers love it. All done up for Christmas stocking stuffers is an excellent marketing point. And they stand up well to mailing in a bubble wrapper. COMMENTS: Perfect thick boxes for packaging anything! COMMENTS: I bought 50 boxes to test out packaging ideas. I wish I had purchased more. I love the simple Kraft style and the sturdiness of the box. My labels look great on the box and my standard soaps fit perfectly. 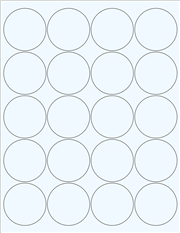 I just wish I could get this in a 3 x 3 square shape for my round soaps. I will definitely be getting more of these. COMMENTS: These boxes look very nice for gifts and fit my bars well. Some people want the natural, kraft look and these fit the bill. I'm sorry I didn't order more and that I missed out on the sale yesterday. Also, these arrive flat, so they're easy shipped with soap orders. Use these and you're ready to wrap or give as is with a bow or ribbon. • Perfect the way they are. COMMENTS: I love these boxes for my soaps. I love the natural look they provide. "PERFECT for shipping small products!!!" COMMENTS: I love these little boxes for shipping single bars of soap - they fit perfectly! I also plan to use them for retail, soon. The boxes are quite sturdy. I shrink the shipping label (page size) so the labels can fit perfectly on these boxes. I will be back for more! • The price is right ! COMMENTS: I used this for my M&P soap I used in the plastic mold. Once the soap was wrapped in an airtight wrap, they fit perfectly in this box. It makes soap presentation look very professional. "Perfect size box for CP soap bars"
COMMENTS: These boxes are great. I prefer not to have open windows on my boxes. These are easy to put a cigar band or label on and look very professional while keeping the contents clean. Will definitely order more. COMMENTS: These are a nice small size that fit in padded mailers well. I put mini bath fizzies, and soaps in them. 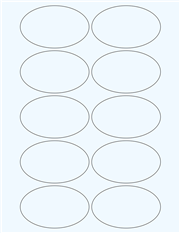 They box is big enough that my labels fit comfortably with space around the edges. 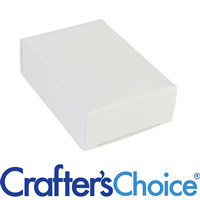 COMMENTS: I love using this box for my Melt and Pour soap bars! I like that it is brown and looks more "natural", and that it also doesn't have a window which leaves plenty of room for my own labels. COMMENTS: I ordered a soap box because I needed to wrap my products better and to my surprise my soap bars fit. The bars weight just about 4 to 4.5 ounces. Now I'm ordering the boxes by the hundreds. The boxes are great labeled with ivory colored labels. COMMENTS: Perfect for packaging my soaps! COMMENTS: Perfect for cold process soaps. 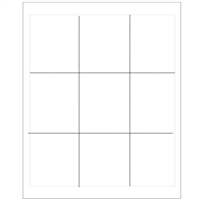 They are easily customized with labels and perfect for shipping. Love it! COMMENTS: I bought these to try out. I like them a lot but only carry them to use if a customer just buys 1 bar of soap (as protection). These work very well with my bars and with my loaf size bars too. They are durable and easy to "construct". A very nice box. COMMENTS: Love these As I use them for many things from Soaps to anything that fits! Plus Im a fan of the color since I like the natural Look. Very Nice & come in handy! Will definitely be getting more But Im thinking of a window in the next order just for something new! "Soap box - no window "
"I see some of the other box styles come in white. Maybe this could be an option someday for the boxes without a window?" Staff Answer Thank you for your suggestion. We will pass this on to our Purchasing Department. "Is there any way to get these in black? I prefer the no window style and would love to find them in black for my men's line. " Staff Answer We do not know if this color is available or if we would add this to our product line but we will pass this information on to our Purchasing Department. "Will the Bulk (1000) option be returning? It was a great deal and we cant justify buying 10 packages of the 100 count for 200 dollars. " Staff Answer Our Purchasing Department is working on this with our vendor. We hope to have the bulk pricing back on the site very soon. "Will the 1000 piece bulk option be returning? It seems to be an option for every other style of soap box. " "Why is there no more bulk for these? I cannot buy 100 at a time... "
"Would these boxes be adequate for shipping with USPS or UPS?" Staff Answer These are not adequate shipping boxes. You would need to pack them in an outside box for shipping. "I oftentimes add oils to my soaps. Are these boxes leak proof or have a coating inside to prevent the oil from seeping through?" Staff Answer These boxes do not have a coating. They are cardboard inside and out. 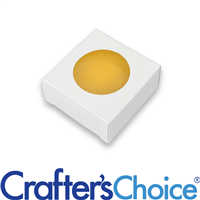 Most people use them to package their cold process soaps since they are not airtight. If packaging melt and pour soap, most people do either shrink wrap or package with plastic wrap to keep them airtight. 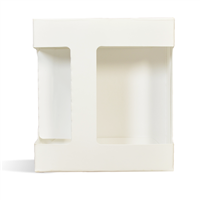 "Whats the best mold size for this box? 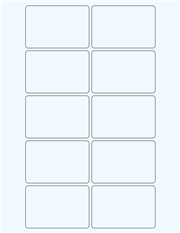 I want to fill the box as much as possible... not the normal 3x2 size bars. Please help!" Staff Answer Our Regular Loaf Silicone Mold 1501 and Tall & Skinny Loaf Silicone Soap Mold 1505 both fill this box to the max when sliced in 1" thick slices. "Will you ever get this one with rectangle windows? I really would want them! 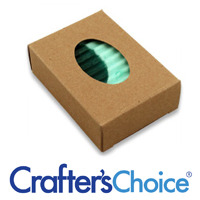 THank you"
Staff Answer We carry a Crafters Choice™ Soap Box - Rectangle Window (KRAFT COLOR). You can find this under Soap Boxes on the "Bags & Wrap" page. "What is the thickness of the walls of this Soap Box?" 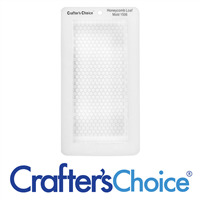 "Will this soap box hold an one inch thick slice from the regular size silicone loaf mold?" 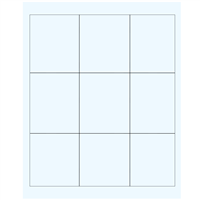 "It is hard to distinguish from the picture, do these open from the top or the sides?" They open on the top and bottom! I love these boxes! Staff Answer If you set this like a cereal box sits on a store shelf, it opens at the top and bottom.